Between DC Direct and DC Superheroes, there are very few notable Batman villains we don't have good representations of yet. That list just got a bit shorter, too, with the release of the Trinity Ra's al Ghul. This billionaire eco-terrorist is against everthing Batman stands for, making him one of the Caped Crusader's chief rivals! Yes, we've had a Ra's before, released as part of Series 3 of the "Hush" figures, but it wasn't exactly the well-​known, iconic look, was it? He was running around shirtless in a pair of form-​fitting pants, and while that isn't unheard of for him, it's not what people think of when they think of Ra's al Ghul. Where's the immaculately tailored suit? Where's the cape? Turns out they're all right here, along with a few other goodies. Though Ra's is strong and knows how to fight, he's more of a cerebral foe: he has minions to do his heavy lifting, so he's not one to wear silly costumes or power armor. He dresses in a regal, gentlemanly manner - it's unusual, but not outlandish. 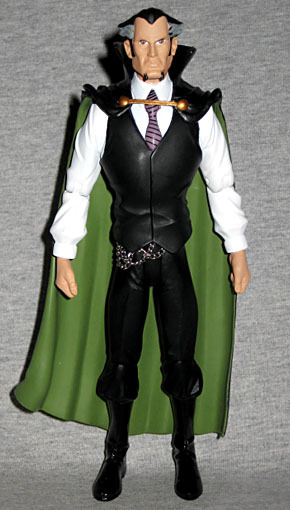 He has his green-lined cape, of course, with a golden clasp across his collar. 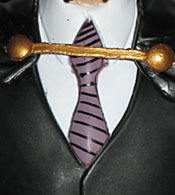 The sleeves of his white dress shirt are a bit poofy, and his tie is opera mauve with thin black stripes. He's wearing a black vest that is slightly lighter than his pants, while his boots are gloss black. Paul Harding sculpted this figure, and did a great job of turning Matt Wagner's sparse, disconnected art into a three-dimensional form. True to form, the chest is far bigger than the rest of the body, because that's the way Wagner draws. The prototype showed a chain helping keep the cape in place, but on the final figure, that's been scrapped in favor of three loops at his waist - another feature taken directly from the art. Sadly, his hands are permanently closed - no giving him a sword, a bottle of wine or anything else interesting. All he can do is stand around with his hands at his side. The face is quite good, really capturing al Ghul's displeased scowl. His hair is swept back into little wings (which would make him great for a custom of the evil archer Merlyn), and he's got that goofy little beard thing he's known for. This is a much better take than the "Hush" version gave us. His eyes are pained gold, as they were in the comic, but the paint on his beardlets is uneven - it comes up higher on his left cheek than on his right. Still, there's no mistaking who this is. Ra's stands 6⅞" tall, and moves at the neck, shoulders, elbows, wrists, hips, knees and boots. You'd think DCD could have hidden a waist beneath the vest, but no. The figure includes one accessory (in addition to the bright blue disc base), and it speaks to his regal demeanor: a leather glove! Okay, so that doesn't really mean anything by itelf, but there's a bird perched on his wrist. Ra's apparently enjoys falconry, long the purview of the upper classes. The glove is detailed nicely, and the bird is cute. It's at rest, so its wings are folded by its sides, and it's wearing its burgundy and gold hood. 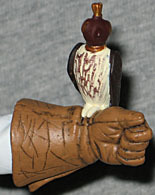 The hand pops off easily, and the glove snaps in, maintaining the point of articulation. Though he's most closely associated with the League of Assassins, that's just one of the many organizations that make up The Demon, a vast cartel of criminals that has been around for at least 500 years. Operating subtly and in secret, The Demon has managed to worm its way unseen into every facet of society - the League of Assassins is just the fang that protects the head. Of course, as the leader of this huge group, it's no surprise this immortal foe has named himself Ra's al Ghul (رأس الغول) - "the Demon's Head." He's probably not toyetic enough to appear in Mattel's line, so it's nice that DC Direct has given us a good version of him.